Today we begin our series on Greece! Some of you may remember my brief “greeting post” from Greece back in April. I apologize it’s taken me this long to share the details of that trip with you. Traveling is great fun and all, but it really makes one fall behind on . . . life, I guess. Thankfully, summer is a great time to catch up on a lot of things, including some of my long-overdue trip reports! Please enjoy this series on a fascinating region I know so little about . . . . In the US, we tend to associate the well-known Greek pastry, baklava, with a particular form: layers of phyllo dough interspersed with nuts, oil, and honey. In fact, this ancient dessert* appears all over Greece in so many different fun and unexpected shapes and sizes. We saw this egg-roll form of baklava in Delphi, where the server told us the cylindrical shape was characteristic of the region. These were delicious – thin, flaky and crispy on the outside yet substantially nutty, sweet, and moist on the inside. We stumbled upon this caterpillar-like walnut baklava in a tiny bakery outside of Athens. [They were only OK – a bit dry]. This layered one looks a bit more like the kind that we’re used to seeing in America. This version was unique because it was made with pistachios! I’ve never seen this before! Chocolate baklavas! Another popular dessert we saw was kataifi, a shredded vermicelli-like phyllo dessert. The thin-wispy “noodles” are mixed with nuts and honey, not that dissimilar from baklava except for the texture. Ekmek Kataifi is a version of kataifi that combines the shredded vermicelli with gorgeously creamy custard. I much prefer this version! I was thrilled to see Ekmek gelato (something I’d never seen before), and had to try some. Of course, one of the most classic desserts (found ALL over the place) is Greek yogurt with honey. I have always preferred the thick, creamy texture and flavor of Greek yogurt (full fat, please! ), so I was thrilled when I saw it everywhere in Greece. Every restaurant offers it as a dessert option. If you don’t want to eat at a restaurant, you can pick up tubs of it at any convenience store or market. And it’s sooo good everywhere. Thick, creamy, slightly tart – it goes perfectly with sweet honey or fresh fruit. Ahhhh . . Santorini . . .
*it’s been around since the 1500’s and an earlier version was even spotted in a Chinese cookbook from the 1300’s! It sounds like the Greek sweets are a lot like the Lebanese. I think most Lebanese baklava are made with pistachios and they are usually made into all different sorts of shapes. I also find they’re a bit less sweet than the Greek variety. Can’t wait to see the next segments! fun posts & brings back great memories! the riots started up again in Athens this past couple weeks. =( hopefully the tourists who are descending upon Greece in droves during the peak summer season won’t have their vacations ruined. 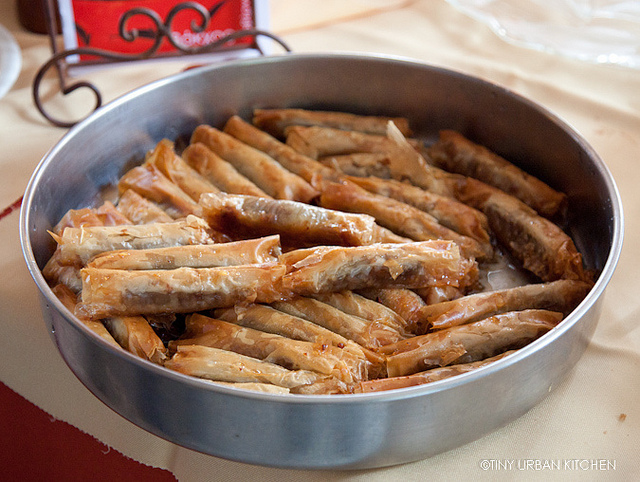 The word ekmek is turkish and “ekmek kataifi” is derived from the turkish “ekmek kadayifi”. The word dolma is also turkish…however it doesn’t necessarily mean it is turkish. The ancient greeks used to wrap their food in vine leaves and fig leaves way before the Ottomans took over. A lot of greek words over the last 500 years or so have been adapted into greek language because they had to either by ottoman law or because they got used to it! However be it Turkish or Greek who cares! Ekmek is delicious! !